Cheap, easy, fresh and local mushrooms. As the crowd grew uncontrollably, The Captain began explaining that saprophytes like the Shiitakes and Oysters will colonize on any organic decomposing substrate such as the dried, sterilized straw we would be using today. 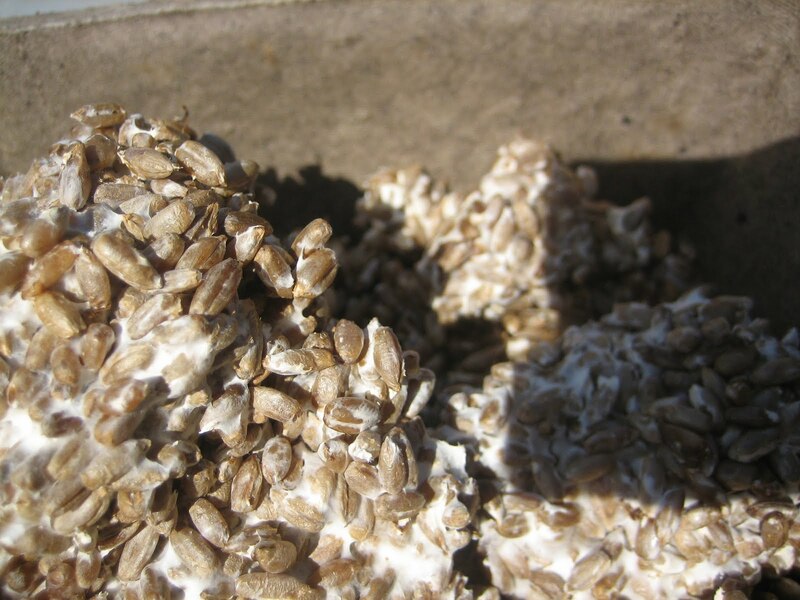 Using sterilized straw is important because the goal is to have as little competition as possible and we want the Oyster mushroom mycelium to have the advantage over any other organisms that may want to decompose and feed off this straw. Sterilizing can be as easy as soaking the straw in boiling water for about an hour. These bags of hay are filled with this Golden Oyster mushroom spawn, which will use the sterilized straw as the substrate to colonize and fruit these beautiful and unique mushrooms. As you can see below, these leftover coffee bean bags are a perfect home for this mixture of straw and mushroom spawn. Coffee bags are great because A. there are plenty of coffee shops that go through hundreds of these a week and they are porous which allows the mushrooms to fruit right through the bag. After blending the mycelium and straw together with water, these bags will go into a dark, moist location. In about just one month, mushrooms will start to pop up. So there it is, 3 methods, 3 cheap, easy and interesting ways to grow your own mushrooms at home. Whether it's in the basement of your house, on the balcony of your apartment, or in your backyard, there's no reason to overpay for those delicious gourmet mushrooms at the supermarket any longer. This is grass hay or wheat straw? Thanks for reaching out. Was this post helpful to you? Have you done any inoculating before?